Every summer since 1986 I spend my five-day vacation camping and exploring Nevada, the Mojave Desert, and parts of eastern California. I explore old ghost towns, mines, mining camps and anything else of interest, while enjoying the beautiful scenery and wide open spaces. 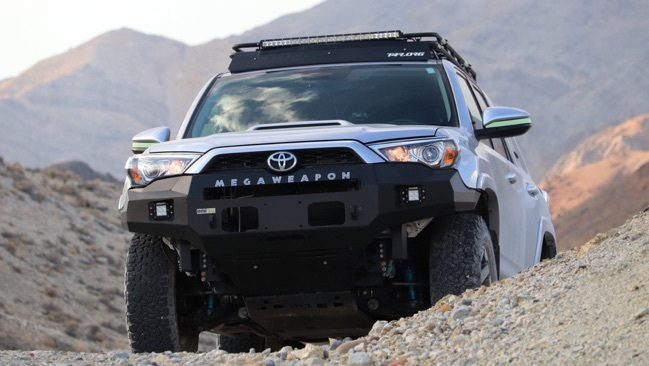 This year was the third trip with Megaweapon, my 2016 Toyota 4Runner. Last year I used a Mavic Pro drone to shoot aerial photos and video to document my trip and the amazing places I visited. This year I planned to do even more video, both with the drone and on the ground. I had multiple cameras and two camera gimbals. Many of the places I visited on this trip were new to me, and all of them are fascinating! 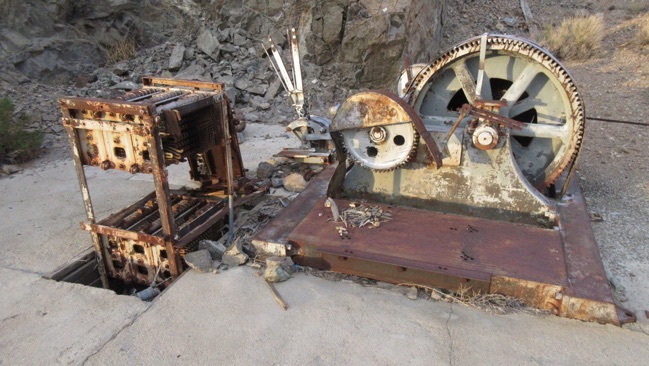 I saw a mine which still had some of its original equipment, over 100 years old, including a double-drum air hoist. 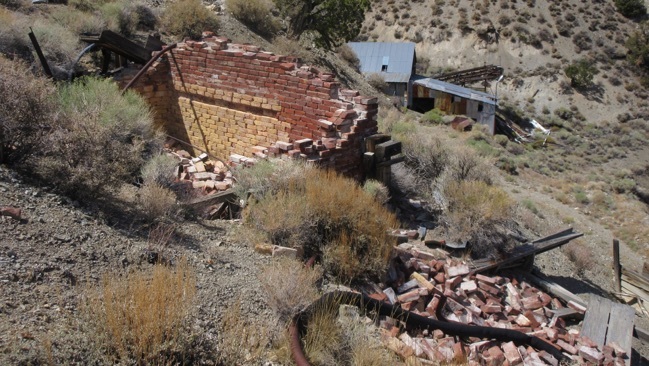 I saw ghost towns in various stages of decay; stone ruins dating from the 1860s; a compact mine and mill; and an unusual ore bin at a manganese mine, among other things. 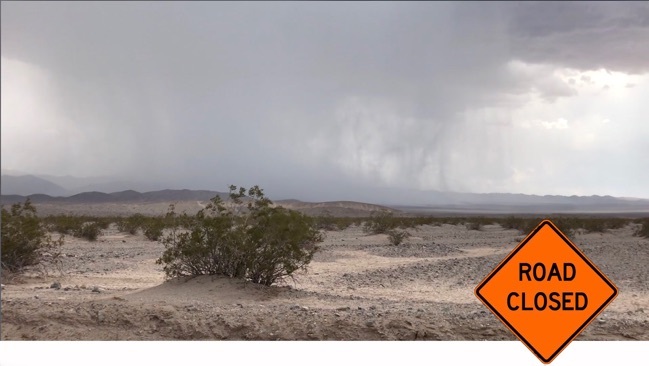 Above: Thunderstorms brought heavy rain into the desert near the southern end of Death Valley. Meanwhile, road closures forced me to change my plans several times. Things got off a bad start right away. I had planned to take highway 395 north through the Mojave desert, then go up through Panamint Valley and explore some sites in that area. But there was construction on 395 causing lengthy delays. So I stayed on the I-15 freeway to Baker, and then went north through Death Valley. From there I figured I could explore some sites in the Panamint Mountains, and then cut over to Panamint Valley. A huge thunderstorm was brewing south of Baker, and followed me into the southern end of Death Valley. The rest of the valley was hot and sunny, with a few clouds. 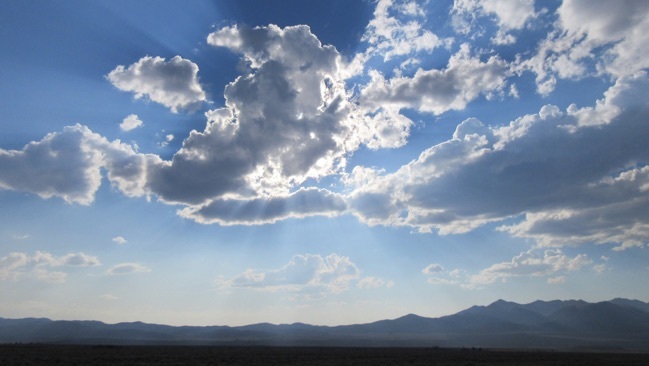 The temperature at Furnace Creek was 118, with a strong wind that felt like a blow torch! Once again my plans were thwarted -- the National Park Service had closed all of the roads on the west side of Death Valley and into the Panamint Mountains. So I kept going north. The road through the far northern end of the park was closed too, but not gated. I proceeded carefully, encountering several dry, washed out areas that posed no difficulty for my vehicle. At the north end of Death Valley, the road turns westward across the Eureka Valley. 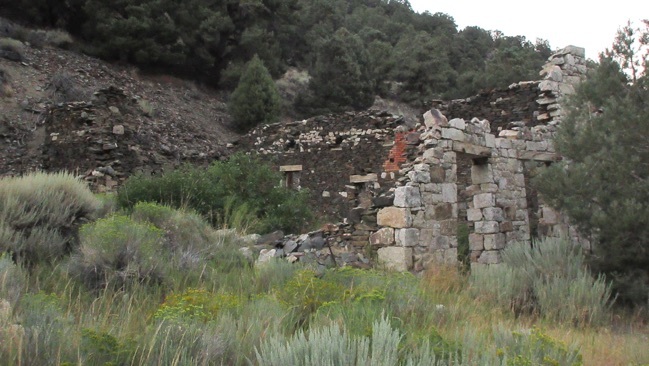 In the mountains west of Eureka Valley I stopped to explore the ruins of the Nikolaus-Eureka copper mine. This copper mining area became active in 1906, and included a small town called Loretto. The ore near the surface was rich, but the vein wasn’t deep. 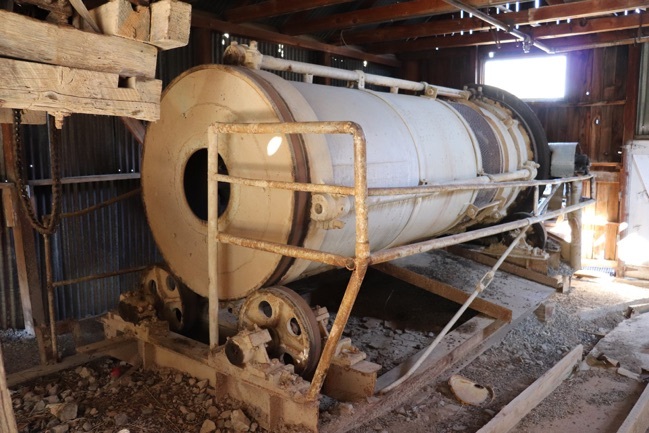 Long after the mines had shut down, a new smelter was built in the 1970s to process ore recovered from the mine dumps. A few hundred tons of copper ore was processed before the smelter shut down for good in 1977. I found only a few ruins at the mine, including the remains of an electric hoist, a fallen headframe, concrete foundations, a shaft, and adit. Mine roads extend higher up the mountain and someday I would like to find out if they are passable. 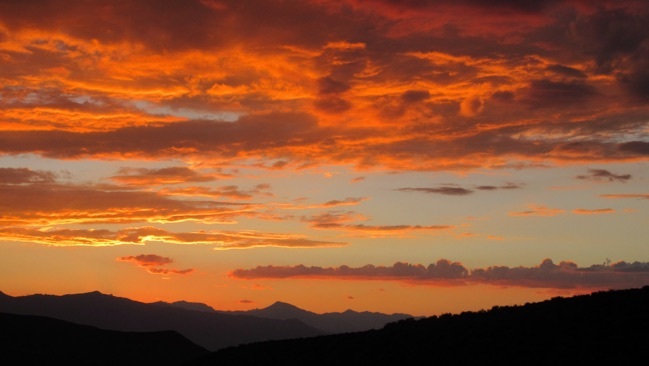 The sun was setting as I left the mine, and I was treated to a spectacular sunset. 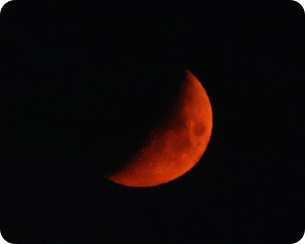 Later that evening the crescent moon was tinted red by the distant smoke from fires burning in central California. 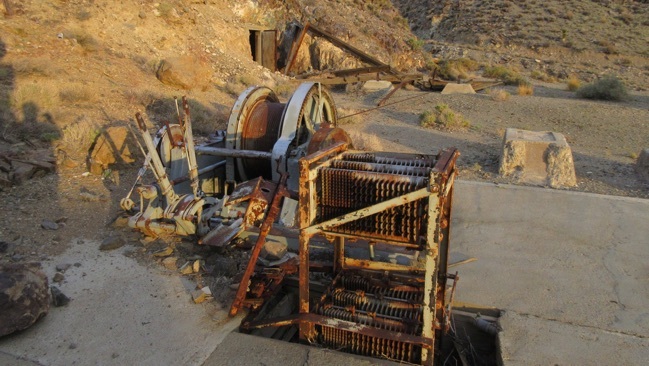 The Belleville Mine is hidden way up in the Pilot Mountains east of Mina, NV. 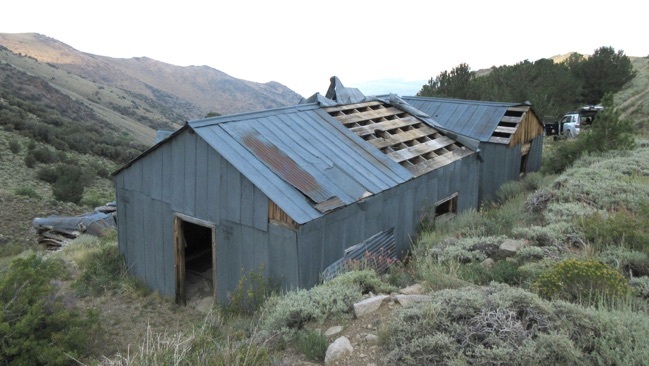 The mine was originally worked in the 1920s and ‘30s, producing $42,000 of gold. There is evidence of more recent work, such as the relatively modern street lights used to light the area around the mine and mill. The mine itself is caved in. 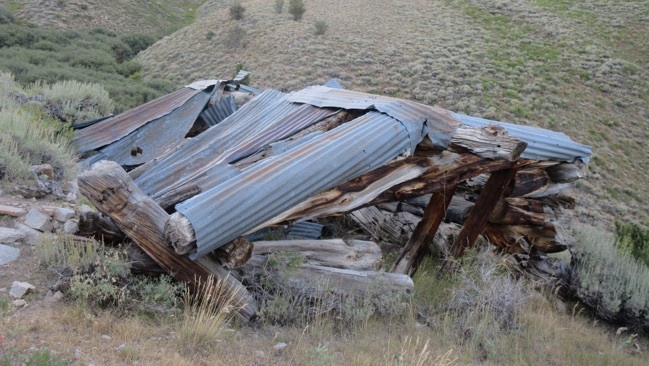 In addition to the mill building, there are a pair of cabins in ruins, an outhouse, a water tank, and other minor ruins. 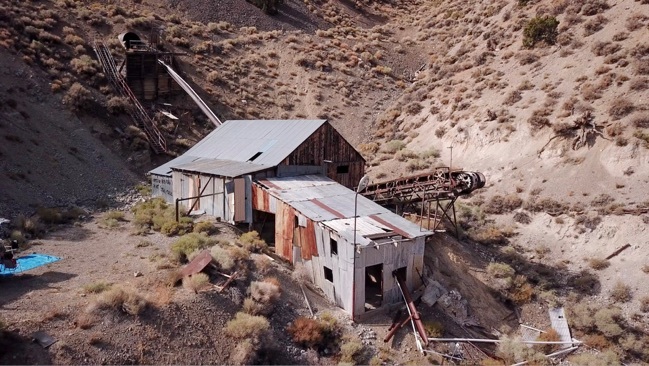 Click here to see a video tour of the Belleville Mine and Mill, NV. Above: Rotary milling equipment inside the mill. Below: The remains of a furnace, which probably dates back to the mine’s earliest period of activity. Above: One of two cabins at the site. The second cabin is in somewhat better condition. 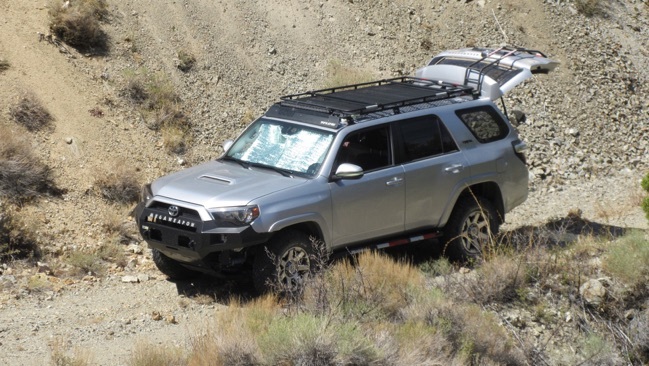 After I had finished exploring and photographing the structures at the Belleville Mine, I discovered that the battery had died in my 4Runner. 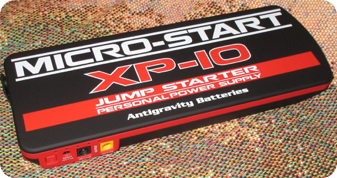 The previous year I had purchased a lithium jump-starter for just such an occasion. The Micro-Start XP-10 was easy to use and had plenty of power to instantly start the engine, and still had enough “juice” leftover for multiple starts. 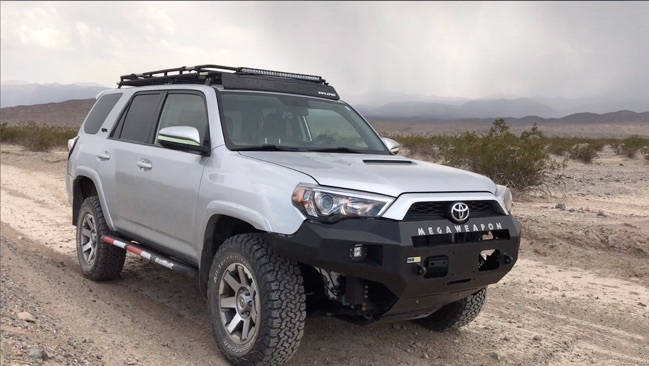 However, I didn’t want to take any chances, so when I left the Belleville Mine, I headed straight into the nearest town (Hawthorne, NV) and had the vehicle’s battery replaced. 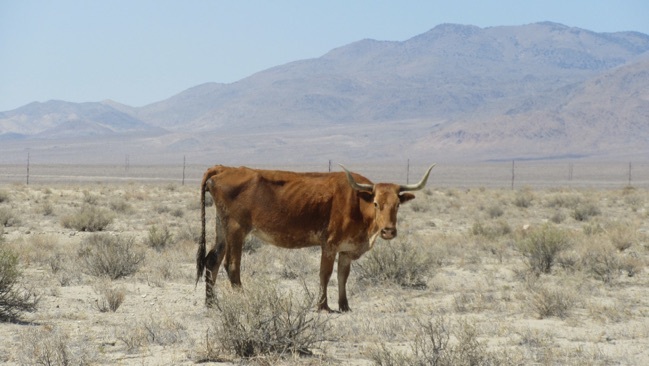 Above: I passed this solitary cow wondering the desert near Luning, NV. Above: The late afternoon sun sends streams of light through the scattered clouds over the Reese River Valley. 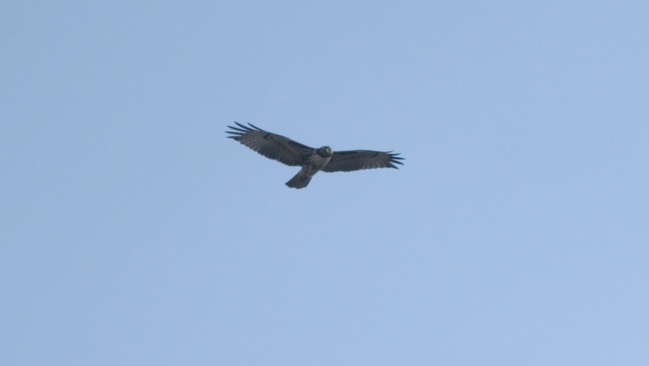 Below: A soaring hawk swooped down to check me out. 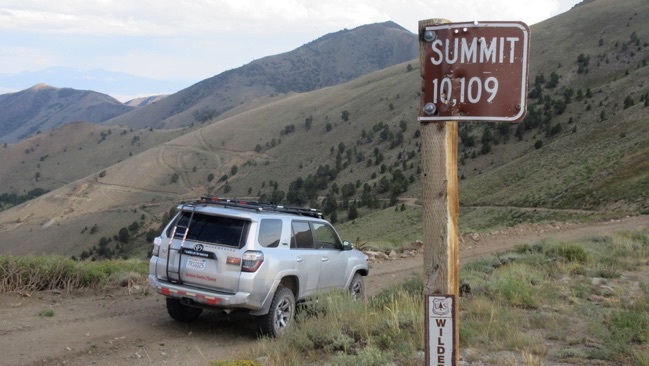 Above: As I crossed the Toiyabe Range, I stopped for a photo at Ophir Summit, elevation 10,109 feet. 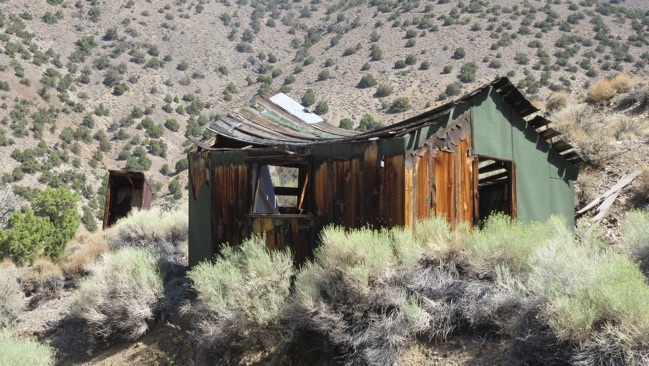 Heading down into Ophir Canyon, I stopped to check out a small group of old cabins. There are two cabins covered with sheet metal. The smaller of these may have been a shed or workshop. The larger cabin has two rooms, though the interior wall has been stripped down to the frame. Below these cabins is a log cabin which is falling apart. It appears to be much older than the metal cabins. The roof of the log cabin was covered with sheet metal, however this was probably added long after the cabin was originally built. So far I haven’t been able to find out anything about the history of these cabins. 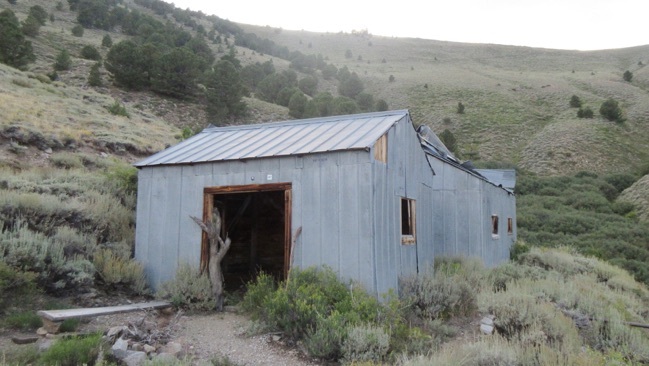 Click here to see a video tour of the Ophir Cabins, NV. 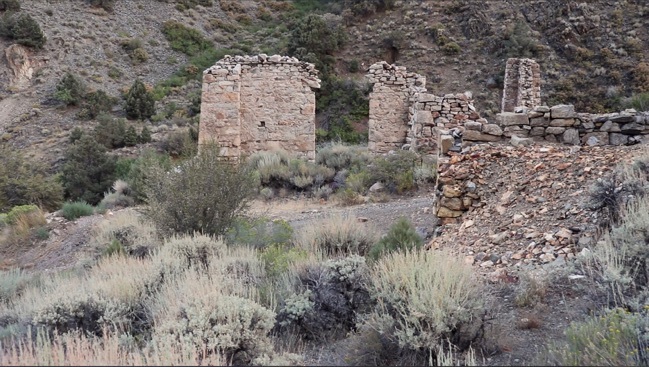 A couple miles below the cabins, I came across the ruins of Ophir, a mining town dating back to the 1860s. I’ve been here before, but it’s been several years since my last visit. I was happy to see that the ruins are still pretty much the same. The primary ore here was silver, imbedded in rock so hard that 30 drills would be dulled drilling a 2-foot deep hole. The high cost of extraction caused bankruptcies and shutdowns in the early years. The longest period of steady production lasted from 1874 into the 1890s. The sun had already set when I reached Ophir, and it was getting dark by the time I left. 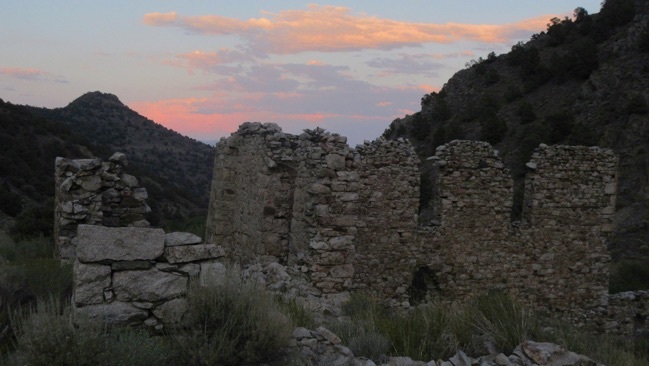 Click here to see a video tour of Ophir, NV. 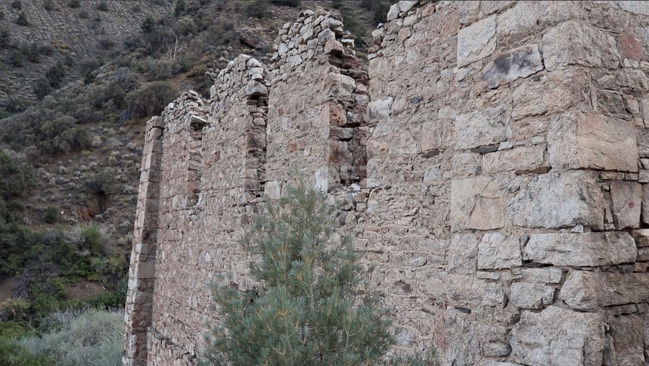 Above: The most impressive ruins are the remains of the Murphy Mill. Below: This large stone building may have been a store. Above: Another view of the Murphy Mill ruins. 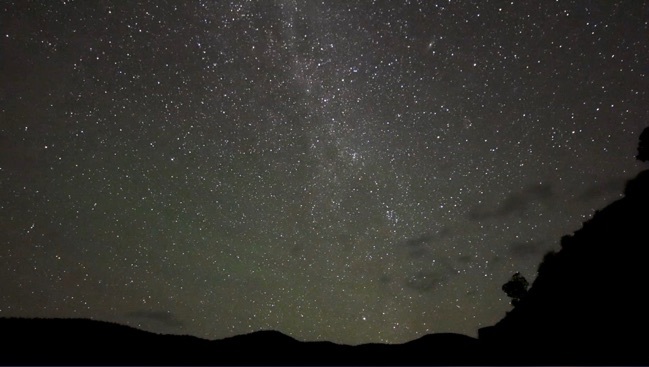 Below: The night sky over the Croesus Mine. Leaving Ophir, I continued eastward to my next destination, the Croesus Mine. 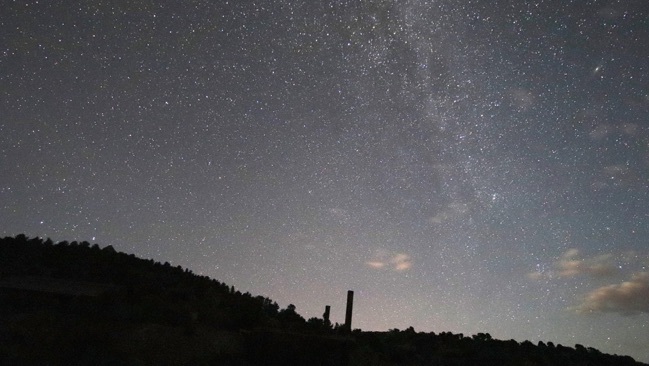 I arrived late and camped near the mine, immersed in darkness and the sounds of crickets. Coming up: The Croesus Mine, 100-year old equipment, the Eureka Tunnel mine, and more as the adventure continues!